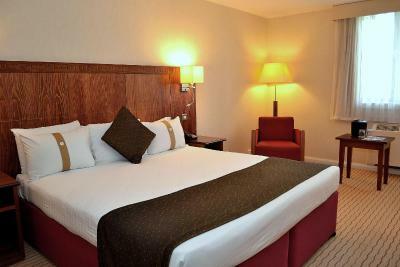 Lock in a great price for Holiday Inn Northampton - rated 8.2 by recent guests. We were greeted very well and we're told straight away that our car registration needed to be documented to avoid a fine. Bar staff were very helpful giving us some extra ice and we're always polite. Our room was cleaned very well and we had fresh towels, beds were made, fresh toilet paper etc. Bathroom was impressive and shower was lovely and strong. breakfast was amazing - staff were very helpful. We were initially given a room without a bath which we had booked specifically as we had been white water rafting over thew road, staff were very helpful & switched us to a different room with no problems. Location is just right for us, as we need some quiet time. Breakfast options are brilliant. I love the gym on site. Staff are very friendly and helpful. Price was very good. Room was as expected - but looking tired. Good parking. Location fine-used for stopping off to visit relatives. Shower excellent. In theory this hotel should be perfect- it's only a very short drive to the University - so perfect for visiting lecturers or for overnighting when dropping off students. The mini gym was decent with good quality machines, though a little old, with a water fountain and lots of towels. There are lifts to access the rooms and the breakfast was very good. Offering a good range of cereals, drinks and pastries as well as cold food- meats/fruit and a great hot breakfast with both streaky and back bacon, two types of sausages and the holy grail - hashbrowns. The bathrooms also seemed to have been recently renovated with a large shower and lots of shelving by the sink. The breakfast and the mini gym seem almost misplaced - they belong in a more plush hotel! The rooms are comfortable and nicely decorated and feature both a bath and a shower. Tea/coffee making facilities are at the guests’ disposition and there is a work desk in every room. A good breakfast is served everyday from 06:30 until 10:00 at the Holiday Inn Northampton. The brasserie serves a selection of pastas, salads and curries and the lounge bar is an ideal place to relax. The hotel is just 2 miles from the centre of Northampton and only 5 miles from the M1 motorway. The hotel is within a short drive of the area’s many business parks while Woburn Safari Park and Silverstone are reachable within 30 minutes. Holiday Inn Northampton has been welcoming Booking.com guests since 7 Oct 2009. 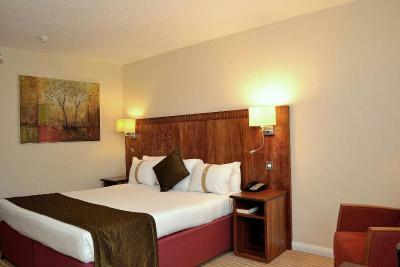 When would you like to stay at Holiday Inn Northampton? Features include satellite TV and tea and coffee making facilities. Bed type preference (Double or Twin) cannot be guaranteed and will be allocated on check-in. This is a large room with tea and coffee making facilities and a work desk. With Egyptian cotton sheets and high-speed internet access. 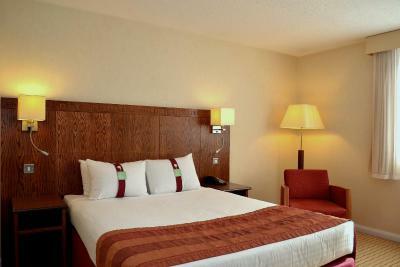 Spacious room with bathrobes and a separate seating area. Features include a satellite TV and en suite bathroom. The Holiday Inn is situated about a 5 minute car ride away from the Town centre, which has a lovely shopping centre and lots of Bars and Clubs and exquisite restaurants. The hotel specialises in Indian Cuisine with a special menu created by our Head Chef, Bilal. House rules Holiday Inn Northampton takes special requests - add in the next step! Holiday Inn Northampton accepts these cards and reserves the right to temporarily hold an amount prior to arrival. All guests on arrival will be asked for a pre-authorisation of the room rate unless the room has been prepaid. Minor faults only: Car park could be better signed. Took time to activate room key (left stranded in dark car park waiting for external door to respond) Pool unavailable. Room was very clean and tidy staff were friendly. Would of been helpful to have fridge in the room. 3 heaters in the room, 2 didn’t work and the 3rd sounded like an aeroplane landing in through my window. No water provided in the room. Had a burger and chips for dinner - disgraceful to be honest. Too expensive for what you get. I have stayed here before and had better rooms. This time however, the tv signal was not brilliant due to the loose cables in the back of the tv to the socket. Also the tea condiments were skimped on. Luckily I had brought some of my own. We did report the tv situation, however, on the 2nd day of our stay we were offered to change rooms, but we were already settled in the room we were in. When we came in the receptionist wasn't very welcoming. We had booked the wrong date in error on our part and she was very good with regards to sorting that for us and still managing to find a room available for us as we had already booked however she was quite rude in the way that she spoke and felt like she was doing us this HUGE favour that none ever can normally do and made us feel really bad. The room, and the hotel in general, looked tired and in need of refurbishment, the wallpaper was peeling, the lock on the door didn’t work and the chair was old and needed to be reupholstered. Bathroom and shower looked new and were excellent. We were disturbed by drunken wedding guests from 1am to 4am returning to their rooms either side of us .